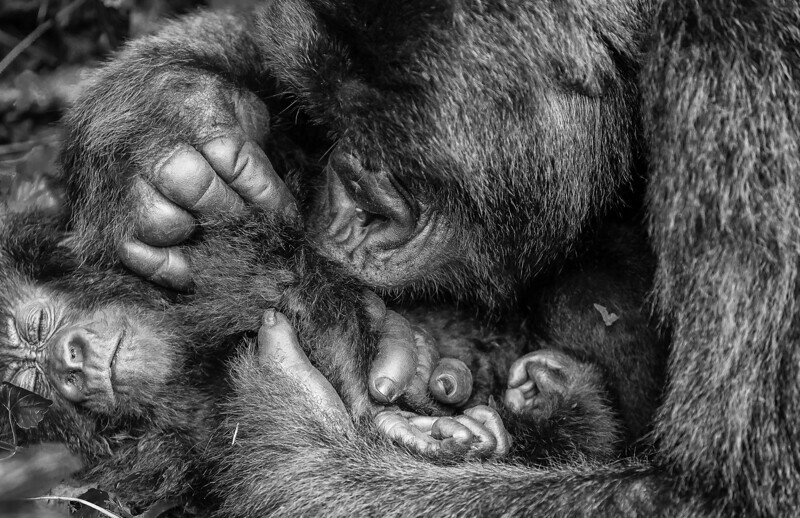 When I saw this silverback mountain gorilla in DRC's Virunga National Park, meticulously grooming a youngster, I was struck by the tenderness and care he displayed. I realised I had an opportunity to illustrate an alternative side to the silverbacks who are more commonly known for their strength and aggression. THe size difference between the baby's and the silverback's digits gave me the scale reference I was looking for, while the calm, peaceful expression on the youngster seemed to exemplify the Mountain gorillas are critically endangered and, in contrast to the relative stability in neighbouring Rwanda and Uganda, the gorillas in DRC are in perpetual danger from rebel forces. The conservation work being done by the rangers, who literally place the lives of the wildlife above their own (many have died as part of their work) is both awe-inspiring and humbling.